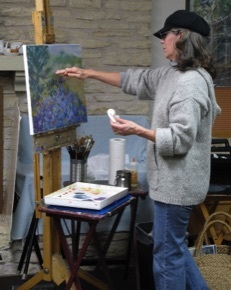 Austin Fine Art Classes offers a clear concise step-by-step approach to learning the basics of drawing and painting. Art is a visual language. You can learn how to see and communicate visually using the elements of line, tone, color, and texture. From this solid foundation you can go in any direction with confidence and certainty, from classical realism to loss free style of the impressionists or anywhere in between. Classes are sold in blocks of four or twelve. With the purchase of a twelve lesson cards you get a free class. A four lesson card must be used in a four week period, and a twelve lesson card must be used in a twelve week period. Each art class is limited to five people but it is not a group class. You are working individually with Elizabeth so you move at your own pace. All adults (and possibly young adults, depending on their maturity and comfort level being in a class with adults) are welcome at any level. This Art Study Program is not appropriate for children however.